This close-up of the sun from June 4, 2014 shows a massive filament of super-hot plasma stretching toward the lower left as seen by NASA's Solar Dynamics Observatory. The filament erupted into a coronal mass ejection later that day. A massive formation on the sun made of super-hot magnetic plasma erupted this week in an explosive solar storm captured on video by NASA spacecraft. The huge plasma tendril, known as a solar filament, erupted on Wednesday (June 4), blowing part of itself out into space in what astronomers call a coronal mass ejection, or CME. NASA's powerful Solar Dynamics Observatory recorded video of the solar filament eruption while the Solar and Heliospheric Observatory tracked the subsequent CME. "Astronomers had been bracing for the possibility that the filament would collapse, causing a Hyder flare when it landed on the solar surface," Phillips wrote in the June 5 post. "Instead, it erupted and hurled part of itself into space." Phillips added that the solar eruption was not aimed directly at Earth, but could deal a "glancing blow" to the planet's magnetic field on Saturday (June 7), possibly amplifying northern lights displays. A giant solar plasma filament on the sun rising up off the star's surface on June 4, 2014 in this full-disk view from NASA's Solar Dynamics Observatory. 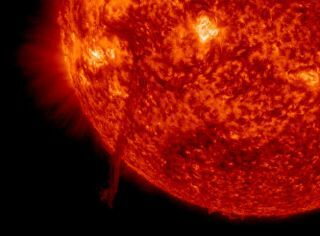 The filament ultimately triggered a solar eruption known as a coronal mass ejection. NASA's Solar Dynamics Observatory and SOHO — a joint mission by NASA and the European Space Agency — are part of a fleet of space observatories regularly watching the sun for signs of solar storms, eruptions and flares. The most powerful solar eruptions can pose a danger to astronauts and spacecraft in space, as well as interrupt satellite navigation and communications systems. They can also interfere with ground-based power and communications systems. Strong and moderate solar storms can also supercharge the Earth's auroras, triggering dazzling northern lights shows. Last year, the sun passed its peak period of solar activity in its current 13-year weather cycle, known as Solar Cycle 24.